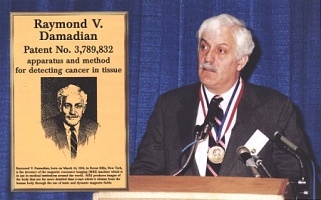 Dr. Raymond Damadian at his induction into the National Inventors Hall of Fame, February 12, 1989, for the invention of magnetic resonance scanning. 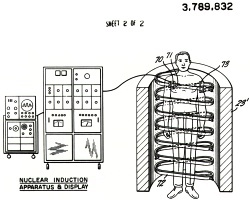 Raymond Damadian's "Apparatus and method for detecting cancer in tissue". US patent 3789832 filed 17 March 1972, issued 5 February 1974. Image from the US Patent and Trademark Office. 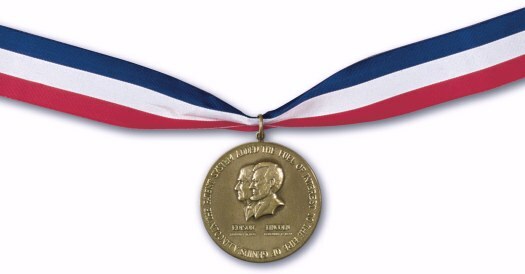 I am pleased to send warm greetings to everyone present for the 1989 induction ceremony of the National Inventors Hall of Fame. America must maintain its competitive edge. The challenges before our Nation are too numerous, and the stakes too high, for us to permit the eclipse of that traditional wellspring of our productive genius: our willingness to try new ideas. In the past we have risen to every challenge presented us, and I believe we can rise to the challenges of today. But only if we foster the spirit of invention. And so I join you in saluting the memory of three great inventors being honored tonight: Westinghouse, Deere, and Langmuir. You are fortunate, I understand, to have a fourth great inventor with you: Dr. Raymond Damadian, whose medical inventions are saving lives around the world. In my association with the wonderful INVENT AMERICA! program, I have seen Dr. Damadian at work, captivating young imaginations with the fires of his own. I would not be surprised to see him joined in the Hall of Fame by some of those promising young minds. All it takes is imagination and encouragement, and he is an ideal source of both. He is living, reassuring proof that the spirit of invention continues to thrive in our great Nation. Barbara and I join the American people in congratulating Dr. Damadian and in sending our best wishes to all of you.